And this brings me to a new “paste” for quilters….Roxanne’s Glue-Baste. Its water soluble and best of all, the non-clog tip puts just the right amount for glue dots on applique or binding. There are a couple of minor caveats. Always store the bottle upright and let the dots dry just a bit before stitching so the machine needle stays clean. Glue-Baste was used to make the construction of the petals in our new centerpiece pattern Bloomin’ Awesome even easier. Stitch up either of these new patterns. Both are ideal in your home, make wonderful gifts and are winners as in-shop class projects. Bloomin’ Awesome is just that! This centerpiece has layers of petals for a 3-D effect and is built on a round Bosal placemat form. With the Holidays coming what nicer way to make “Eazy Elegance for Your Table” and of course this is a hostess gift everyone would love to receive. 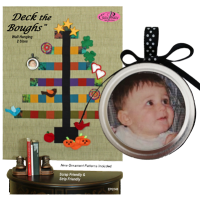 Deck the Boughs wall hanging pattern comes with two sizes. Its strip friendly and we’ve included nine ornament patterns that celebrate every season and occasion. My favorite is the photo ornament which lends itself to making your own visual family tree.